The most recent edition (Volume 15, 2012) — available at Amazon.com — features work by Abe Aamidor, Judith Aller, Howard Altmann, Andy Austin, Wallace Baine, Robin Curtiss, Shelley Davidow, Donald G. Evans, Jennifer Firestone, Charles Haddox, Mark Hage, Erik Hanson, Craig Hartglass, Alta Ifland, Nicola Manuppelli, Michela Martini, Lynn Melnick, Idra Novey, James O’Brien, Alice Phung, Signe Ratcliff, Scott Solomon, Samson Stilwell, and John Wilmes. Chicago Quarterly Review has an open submission policy. If you’d like to submit, I’d suggest reviewing the publication (you can buy a copy here) and following the submission guidelines (selected details below). WHAT CQR IS LOOKING FOR: The writer’s voice ought to be clear and unique and should explain something of what it means to be human. We want well-written stories that reflect an appreciation for the rhythm and music of language, work that shows passion and commitment to the art of writing. CQR SUBMISSION GUIDELINES: Chicago Quarterly Review accepts short stories, personal essays, poetry, photographs, and prints of artwork. Please do not submit more than one story at a time. We accept simultaneous submissions. We do NOT accept previously published work. 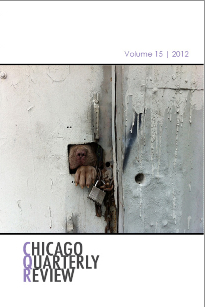 For specific details regarding how to submit your work to the Chicago Quarterly Review, go to this page. (CQR only accepts electronic submissions.) Good luck!